Contractors, Noritz has enriched its ProCard app to make your job easier when installing a tankless water heater. Several new capabilities provide the technical assistance you need when you’re on the job site and not necessarily connected to the internet. ProCard connects the most qualified Noritz installers with customers in need of a contractor. Either online or through the smartphone app, contractors can accept leads from customers who chose them for the job. Become a ProCard member by clicking here. Once the contractor completes the installation in the customer’s home, he or she scans the QR code on the heater by using the ProCard app’s QR code reader. This registers the product’s warranty and earns the contractor points. The more points earned, the higher the contractor’s ProCard ranking will be, resulting in greater visibility to possible leads. Those are the basics. Now, here are the recent upgrades to the app. Interactive Troubleshooting Tools: You’ve probably had computer problems in the past that you used a troubleshooting tool to fix. It asked you a series of questions about your particular problem and offered solutions. 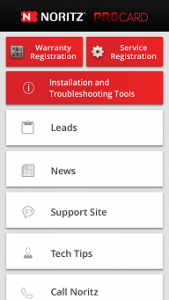 A similar tool can now be found on the ProCard app, so if you are called in to repair a malfunctioning heater or are having trouble with an installation, simply open the troubleshooter on your phone and follow the interactive wizard to resolve the problem. Service History: When you visit the dentist, your entire patient history is logged into a database. Now, the ProCard app provides the same for Noritz tankless water heaters. Simply scan the heater’s QR code for a history of maintenance work it has undergone. Technical Literature: Gone are the days of having to find hard copies of technical information on a water heater. In fact, you don’t even need an internet connection now that the ProCard app contains a full resource library of technical material on Noritz products. Other Tools: The ProCard app also now contains various other tools that simplify installation and maintenance of Noritz water heaters. One such tool is the new gas pipe-sizing calculator. Properly sizing the gas line is crucial to ensuring the water heater gets enough fuel. The app will determine how many BTUs are being used by other appliances to determine the correct pipe size range. These features improve the ProCard app’s utilization for ProCard Members with a faster and more reliable field tool option to help field techs on the toughest job sites. To download the free app on Android, click here. To download the free app on iOS, click here.